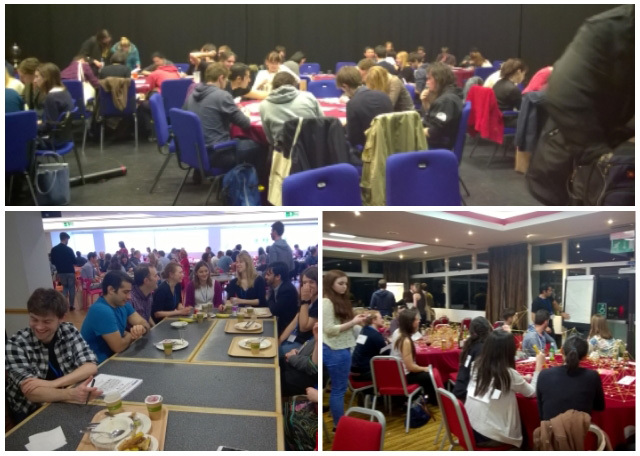 Firstly, thank-you so much to everyone that participated in the student and postdoc events. It was lovely to meet many of you and we hope you had a great time. From the BSDB student/postdoc survey results last year, it was evident that most people wanted to find out more about ‘alternative’ careers other than those on the traditional route of academia. With more PhDs being awarded and few top level jobs there is a need to provide more information as to what else can you do with your PhD. For this reason, we chose to focus this year’s careers session on alternative careers to academia. The highly attended session took the format of roundtable discussions and covered a plethora of topics including but not limited to, consulting, publishing, academic fellowships and engaging with the media. We would like to thank all the table leaders who provided stimulating discussions. This event wouldn’t have been possible without you! From the feedback, we realise how valuable it is for young scientists to talk to other scientists who have trained as cell or developmental biologists and go on to have successful ‘alternative’ careers. For future workshops, we intend to build on this theme and invite an even more diverse selection of speakers. Click here for a more in depth summary of the workshop. This was the first year that we ran science breakfasts, whose goal was to facilitate informal discussions between junior researchers and scientists at the top of their field. A small number of students and postdocs got to participate in this event, discussing everything from research, careers and life in general with Abigail Tucker, Ottoline Leyser, Jordan Raff, Lidia Vasilieva and Thomas Surrey – who we are really grateful for giving up their time. This year the reps decided it would be fun to do something more interactive for the student/postdoc social. We randomly attached a name to the back of every guest, where each name was one-half of a famous pair, such as Romeo and Juliet. Each guest could not see their own name but could see the names of other guests. Using yes-no questions, each guest had to work out who they were and then find the other half of their pair. Each pair were given the task to build the tallest possible tower using marshmallows and spaghetti. The pairs were then grouped into teams of ten which competed against each other in a round of science pictionary. Thank-you to all the sponsors who donated gifts. For the pair that found their pair first won a bound notebook each from Horizon and sweets. 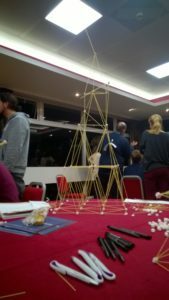 Class Learning provided a voucher for two books up to £100, which was awarded to the winners of spaghetti towers (Erik Clark, Gautham Dey and their winning tower pictured here). Chocolates and sweets from the BSDB committee were awarded to the winning teams after the Pictionary round. Molecular biology of the Cell (Garland Science) was given to the winner of the best image (Rachna Narayanan with a drawing of WALL-E). This year the graduate student symposium was moved to the middle of the meeting, resulting in excellent attendance. This was a truly excellent event – the speakers covered a diverse range of topics in an engaging manner. Some talks even got mentioned in the twitterverse! The format was also altered so that there were six fifteen minute presentations and six five minute presentations. All the speakers did an excellent job – particular mention must be made for everyone who managed to describe their complex research in just five minutes! We hope to see many of you next year. If you have any comments or ideas please get in touch with Alex (students@bsdb.org) or Michelle (postdocs@bsdb.org); especially if you have ideas for games to play in the student social, know someone who would be a great table leader for the careers workshop or if there is someone with whom you would really like to have breakfast.